Monsters, lead by Lord Fang, have overrun the legendary city of Arcadia, lead by Lord Fang. It’s time to reclaim your old home. But you are not alone. There are other warriors also vying for glory in Arcadia. Together, you will clear out the monsters infesting Arcadia, but also battle one another. You want to be the greatest hero ever known? Prove yourself. Arcadia Quest is a 4-player competitive dungeon crawler. It’s like Dungeons & Dragons, but without the roleplaying. You fight monsters, rescue innocents, find treasure, and shoot your friend in the back. It’s got everything. You draft a team of three heroes, each one with a unique ability. These heroes will see you through six campaign missions, ending with a final battle against Lord Fang. In each adventure, which tend to run about an hour long, everyone vies to complete a set of available PVE (Player vs. Environment) quests… and at least one PVP (kill another hero) quest. The combat is simple. Rolling custom dice and trying to land swords (for melee attacks) or bows (for ranged) or crits (good for either). Some monsters and all heroes get to roll defense against your attacks, praying to see shields on those dice to block hits. There’s not much else to it. But don’t let simplicity come across as being “easy.” Arcadia Quest is a tough game, one where you must focus on an army of monsters while keep an eye on your back. After all, every other player is looking for an opportunity to kill you and complete a PVP quest. It’s pretty tough to find a game with streamlined, easy-to-learn rules, fantastic production value, and a lot of replay value. But hey, even fat kids get an extra slice of cake now and then. Arcadia Quest is the whole package. A great game, with awesome miniatures, and fun combat. Arcadia Quest - Look at all those minis! I’m a sucker for a game with great minis. Arcadia Quest monsters come with multiple cards to represent different upgrades. Activate one hero on your turn. Move up to three spaces. Exhaust a weapon to fight a monster or hero. Compare against opponent’s defensive roll. Monsters can counter-attack unless you manage to obliterate them with loads of damage. Maneuver towards item and quest markers. First to complete three quests wins. Suffer Death Curse cards for each death token on a hero. Tally scores for the round. Pick the next scenario and go at it again. Descent or Heroquest or any tabletop dungeon crawler… but with a big focus on PVP combat. I ended up with a big pile of gold at the end of a scenario and then bought two powerful pieces of equipment. I was one move away from collecting a quest token to win the scenario and a “friend” landed a cheap shot into my back. Arcadia Quest requires a lot of table space, but it's worth it. Above and beyond most games. Nice, thick board tiles, great art, beautiful cards, and amazing miniatures. 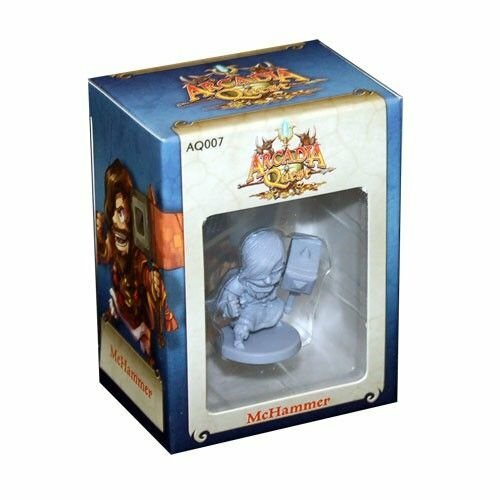 These sculpts are so good, the minis look great even unpainted. And you get a lot of minis. If Cool Mini or Not cut any corners, it's in a total lack of any box insert… and this is a game with tons of chits, minis, and cards. There are little nuances that people might stumble on at first, but this is one of the easier games to teach and learn. Winners buy the first round, right? Already there are some expansion options for Arcadia Quest. And one of the primary ways to enhance the experience is with more heroes. I love variety and since we do a draft for heroes (take one, pass your stack to the next person), the more characters available, the more varied the experience each playthrough. If you love Arcadia Quest, you’re going to want more heroes and probably some extra dice. Long set-up time for a relatively short game. Face a lot of the same monsters. No insert for the box and there are tons of pieces, cards, and minis. You’re a sucker for great miniatures. You like dungeon crawlers, but want to fight other players. You don’t mind games that take a while to set up. Questions about Arcadia Quest? Ask in the comments. 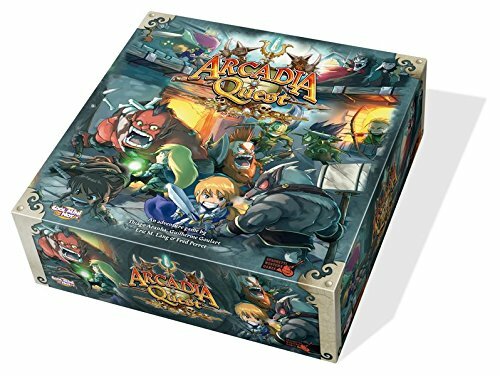 Played Arcadia Quest and have your own opinion? Tell us! We may feature you in the Dog and Thimble Podcast.